Get Your BC Racing Wheel HC 01's at ModBargains! BC Racing Wheels HC 01's are now available at ModBargains with GREAT PRICES, FAST SHIPPING, and QUICK DELIVERY TIMES! Give us a call to order at 714-582-3330. Are you looking for a sophisticated wheel that is sure to attract attention? Well you have come to the right spot! BC Racings Wheels have a variety of wheels, but the HC Series, specifically the HC 01, definitely adds character to your vehicle. And the fact that each wheel is customizable makes your individuality shine. The HC 01 utilizes a stepped lip, concave face, and your choice of exposed or no-show hardware. Although the choices are endless in aesthetics, don’t underestimate their performance. 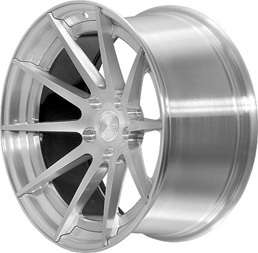 BC Racing Wheels makes every wheel model out of T6061 aluminum for extra strength and lightness. So you can’t go wrong with the HC 01 BC Racing Wheel. BC Racing focuses on their production process that there are absolutely no compromises. Other companies have either aesthetics or performance. But with BC Racing Wheels HC 01's, you get it all, low weight, amazing strength, great quality, durability, and looks that make you differ from the rest. The BC Racing Wheels HC 01 can come in just about any color or finish that your mind can imagine. The limitless customization you can apply to BC's wheels is what gives you car that unique look that distinguishes it from the rest. And with the help of one of our ModBargains product specialists you can order your dream wheel fitment and style in a matter of minutes. So if you're ready to grab a new set of BC Racing Wheels HC 01's, give ModBargains a call at 714-582-3330. So if you're looking for a wheel that will give you everything you want for your SUV or sports car, you've got to go with the BC Racing Wheels HC 01. With it's amazing performance aspects and unlimited customization, there is absolutely no way you can go wrong. So if you're ready to make an order or have any questions about the BC Racing Wheels HC 01's, give ModBargains a call and talk to one of our product experts for info at 714-582-3330. Buying your BC Racing Wheels from ModBargains is an excellent decision. Our product experts will ensure that you order the right fitment and wheel for your car and answer any questions that you may have with ease. We also offer the best customer service in the business, and our delivery times for wheels are quick and easy for your convenience and happiness. We offer great prices on BC Racing Wheels. If you're looking to completely deck out your ride with a new look that's light and strong, grab a set of BC Racing Wheels HC 01's at ModBargains!